You know how nerd stuff sometimes appears in Vanity Fair looking all gorgeous and fancy? A team of cosplayers decided to stage their own version, only this time with the characters from the new Wonder Woman movie. In keeping with the spirit of Vanity Fair shoots, not only did the cosplayers pose around some nice furniture, but they split their outfits between film costumes and formal wear as well. 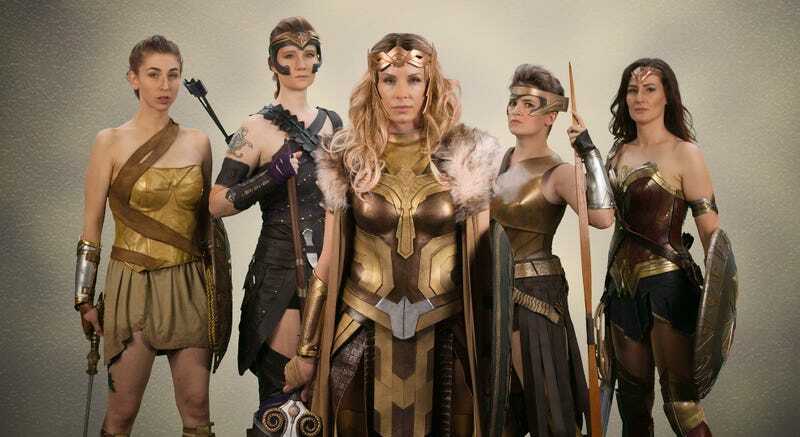 Downen Creative Studios as Hypolita, Harbeastie as Wonder Woman, JJ Stefishen as Antiope, Yasemin Art as Diana (costume by Pat Dooley) and AbbyCat Cosplay as the Amazon (costume by Harbeastie). The formal dresses and jewelry were supplied by Se•Lyn Boutique, while all photos are by Downen Photography.